FAQ: How Can I Handle Multiple or Variable Incomes in EEBA? Q: I have multiple or variable incomes with expenses that are due throughout the month. How can I keep track of everything in EEBA? Q: I have a monthly budgeting period, but I get paid bi-weekly, how can I manage my budget in EEBA? Keeping track of a single, stable income can be hard enough. For those with more than one income, or an income that varies month to month, things can quickly get more complicated. You aren’t certain how much money you really have to spend, or which paycheck you should use to spend on which expenses. Thankfully, EEBA can help. The ideal solution is to pool your income into Unallocated Money as a one month cushion for your budget. Then, use it fund your Envelopes all at once at the beginning of the month. If that’s not an option for you yet, don’t worry! You can still use EEBA to manage your incomes and build up that one month cushion. Here’s how you can do it in 3 simple steps. For many, building up a one month cushion is simply an issue of cash flow. For others a more serious change is needed. Check out our guide on creating a budget based off your income to know you’re starting off on the right foot. When you receive income, head over to the Add Money / Receive Income page and choose “Keep Unallocated” to store your income. 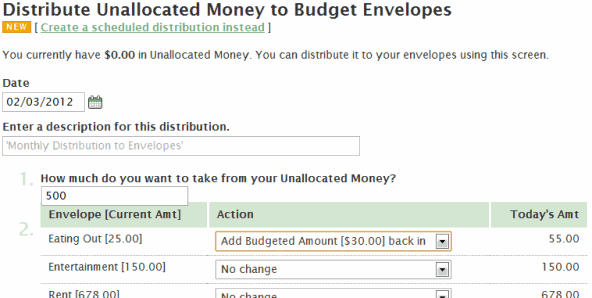 Then, head to the Distribute from Unallocated page to fund your Envelopes. You won’t be able to fund everything, so prioritize Envelopes that you need to spend from sooner, and Envelopes that represent necessities. Only take what you need from your Unallocated Money, making an effort to take less than you put in each time you fund your Envelopes. As time goes on, your Unallocated Money balance should increase. Eventually, you’ll be able to fund all your Envelopes entirely from your Unallocated Money at the beginning of the month. Use Scheduled Items (available on our Plus and Premium plans) to automatically fund your Envelopes the way you like every month. This is great if you want to “set it and forget it.” You’ll probably be a bit less aware of what’s happening in your budget, though – and that may or may not be a good thing. Create a Scheduled Income instead of a one-time income, and remember to choose “Keep Unallocated.” If you get paid on a regular basis but the amount of your paycheck changes, you can edit it later when you know the exact amount. Create a Scheduled Distribution instead of a one-time distribution. Set the amount and “Action” rules. You can make changes later if your distribution varies from month to month. Thanks to Judy for the question! this is what I was looking for. I have used a program called YNAB which has a philosophy that has been great for my wife and I and I think is solid financial advice – LIVE OFF LAST MONTH’S MONEY. This means if we bring home $5k in January, we have exactly $5k to spend in Feb. The bonus of this is it is a full one month buffer no matter what. And you never had to worry about what time of the month a bill comes up. It does take some effort to build up this much buffer in checking, but it makes life easier. Sorry . . . off soapbox. 🙂 This blog post shows how I can use EEBA to follow this rule and do what we have been doing. And the reason I came over to EEBA – wife and I both have Android phones. Thanks, Greg. Living off last month’s money is great advice. When you add money from a mobile device, the option to add from the unallocated funds is not available. I can only do this action on the website. Is there a way to do it on the android device as well? Hi, Julie. Currently, you can only distribute from unallocated on the website. We continue to work on bringing several features of the website to the Android device, and this is definitely on the list. That said, you can always use the website from your Android device–it’s mobile-optimized. For quick access, use “Menu…Mobile Website” from within the app. You can have your browser remember your household name and password if you like to make things even faster. WOW!! this is what i have been looking for …. my spending was getting way out of control between my partner and I. We were living out of checking account. Now we are allotted $50 a week….. PERFECT PERFECT PERFECT!!! nowwww only if i had a blackberry option 🙂 for him……..